Sous vide is how the RainyDayKitchen folks have been cooking meat for the past year and a half. The process is simple and the results are perfect EVERY time. “Finishing” means just a quick flash on the infrared grill or a sear on a hot cast iron pan. 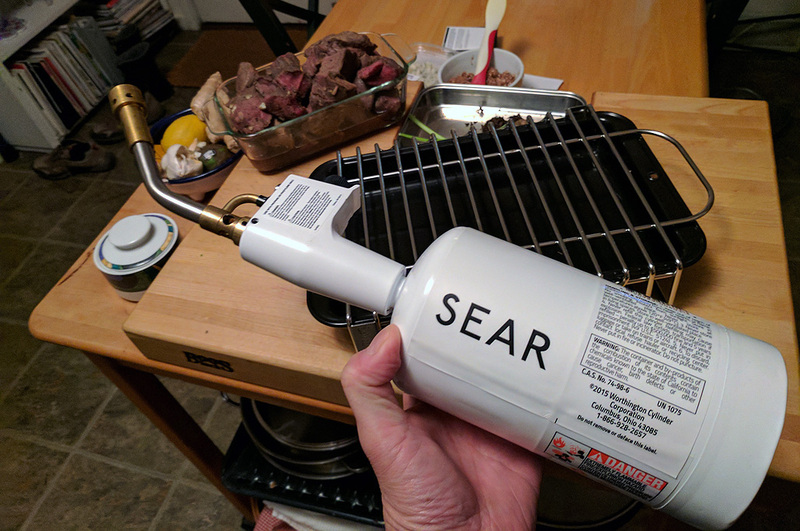 Some cooks use a blow torch instead of a grill or a hot pan to get the sear, a technique we found intriguing but had never actually tried. Last June we did a FirstLook of the Searing Kit from Sansaire with every intention of making extensive use of it over the Summer. However, things got busy and the FirstUse of the Searing Kit never materialized. Fast forward to New Year’s Day. 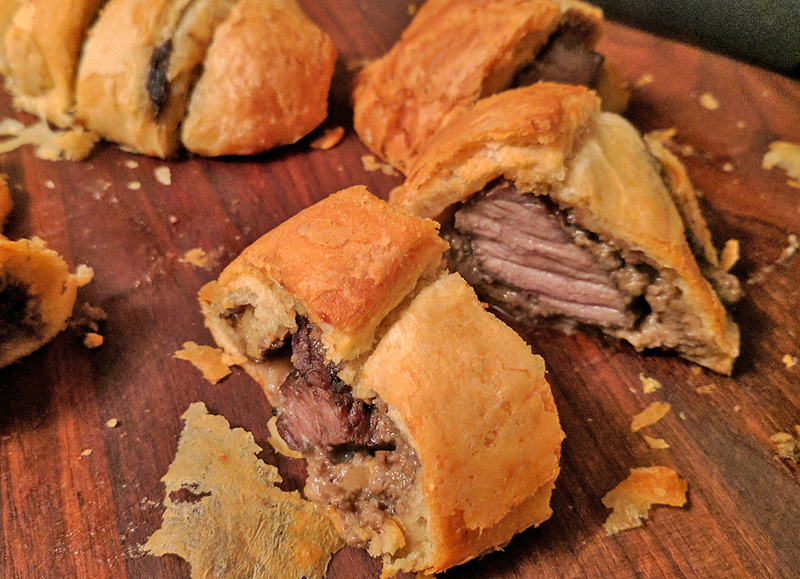 We had invited a few friends over to test out a “15-minute Mini Beef Wellington” recipe RainyDayKitchen had been working on (a “Wellington” is basically a pastry-wrapped piece of meat, normally with a mushroom duxelle between the two). 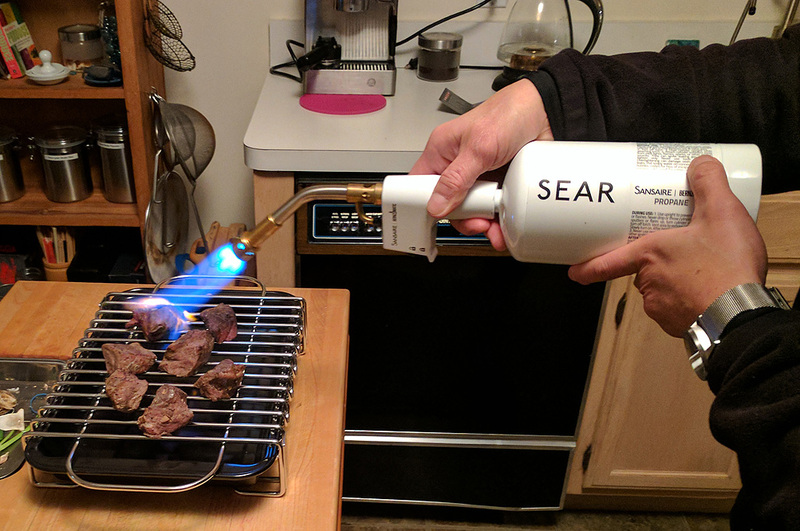 With all the outdoor grills already stowed for the winter, we thought it would be the perfect opportunity for a FirstUse test of the Sansaire Searing Kit! 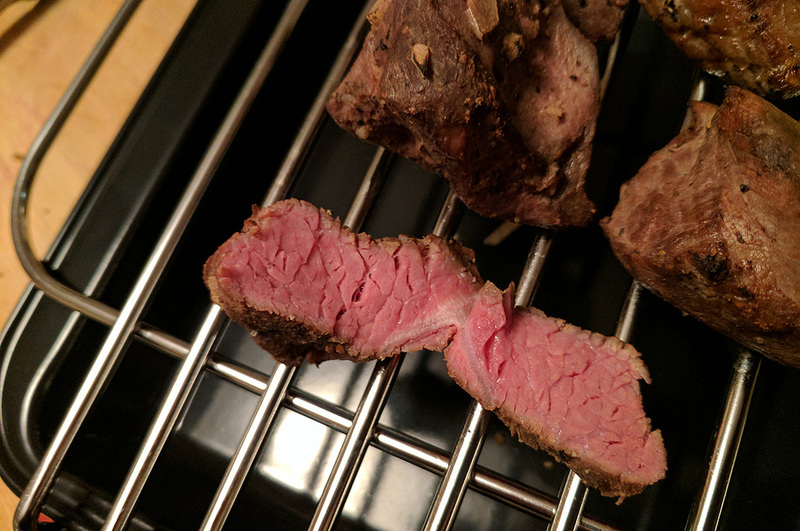 Having cooked steak tips a few times using the sous vide method, we were very familiar with the timing and temperature needed (4hrs at 135ºF = perfect medium), but we thought a sear on the outside of the tips would give it more flavor and seal in the moisture for the baking part of the recipe. The Sansaire Searing kit consists of a specially designed blow torch, a grilling rack, and a drip pan. The torch head is not the same as that available at the local Home Depot. This Searing head is specially design to give a hotter and broader flame, making it faster/better/easier for searing food. NOTE: The use of propane fuel to sear food is perfectly safe. This is the same fuel use in gas grills. Also, the gas has already combusted before even reaching the food, transferring heat, but no “flavor” of its own. About 10 seconds on each tip was all it took to put on the searing “coat.” Edge to edge medium… can’t get this kind of cook using any other method, yet phenomenally easy with the sous vide technique! 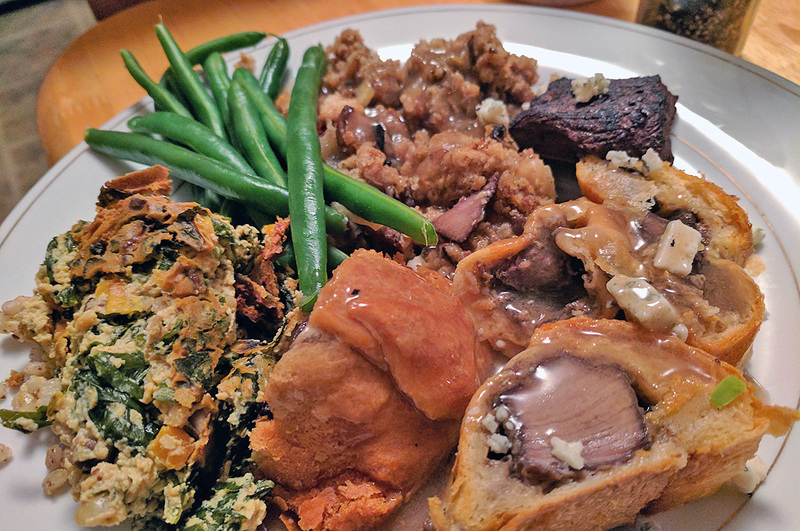 The tips turned out AMAZING and the “Mini Beef Wellingtons” were pretty good as well. We will publish the full recipe when we still have finished tweaking it, but searing the meat definitely kept the tips moist and tender. The only adjustment we would make is to cook the tips to a medium-rare so they would come out even a little juicier after baking! We would consider our FirstUse of the Sansaire Searing Kit a complete success. The torch was quick to set up, easy to use, and worked exactly as advertised. We are sold! Those who like to cook sous vide style should definitely consider “finishing” their food using this technique. Great alternative to ZipLoc and freezer bags!!! Five different meats, 30+ guests, 30 minutes of grilling!! !